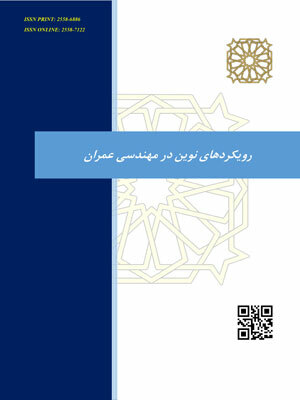 در ساختمان‌های بلند با افزایش تعداد طبقات، طراحان ناگزیر به استفاده از سیستم لوله‌ای یا ترکیب آن با سایر سامانه هستند. پدیده لنگی برش (shear lag) در سیستم لوله‌ای و مشکلات معماری به دلیل فاصله کم ستون‌ها از کاستی‌های این سامانه می‌باشد. مهاربندهای کلی از نوع مهاربندهای همگرا به دلیل داشتن سختی برشی بالا در ترکیب با سیستم لوله‌ای، رفتار این سامانه در خصوص معایب ذکر شده را بهبود می‌بخشند. اما عیب اصلی این سامانه تغییرات ناگهانی تغییر شکل جانبی در برابر باد و زلزله می‌باشد. در این مقاله یک ایده جدید معرفی شده است که در آن از دیوار برشی فولادی در دو انتهای قاب و از مهاربندهای کلی بین آنها استفاده می‌شود. این دو دیوار به عنوان یک بازوی لنگر قوی در برابر لنگر واژگونی عمل کرده و با توجه به سختی بالا، عمده برش را جذب می‌کنند. بنابراین لنگی برش کاهش پیدا می‌کند. نتایج نشان می‌دهد در سامانه پیشنهادی، تغییر شکل جانبی کاهش پیدا کرده همچنین نیروهای محوری و لنگر خمشی نیز کاهش قابل ملاحظه‌ای دارد که نشان از کارآیی بالای این سیستم دارد. 1- Kim, H. and Adeli, H., 2004, Hybrid feedback-LMS algorithm for structural control. Journal of Structural Engineering(ASCE), 130(1),120 –127. 2- Kim, H. and Adeli, H., 2005, Hybrid control of irregular steel highrise building structures under seismic excitations, International Journal for Numerical Methods in Engineering, 63, 1757–1774. 3- Fisco, N. R. and Adeli, H., 2011, Smart structures: Part II - Hybrid control systems and control strategies, Sharif University of Technology, Scientia Iranica A, 18 (3), 285–295. 4- Fisco,N. R. and Adeli, H., 2011, Smart structures: Part I-Active and semi-active control, Scientia Iranica A, 18 (3), 275–284. 5- Mir M. Ali, and Kyoung Sun, M., 2007, Structural Developments in Tall Buildings: Current Trends and Future Prospects, Architectural Science Review, 50(3), 205-223. 6- Chen, J. P., Webster, R. S., Hathaway, M. D., Herrick, G. P. and Skoch, G. J, 2009, High performance computing of compressor rotating stall and stallcontrol, Integrated Computer-Aided Engineering, 16(2), 75–89. 7- Caterino, N., Iervolino, I., Manfredi, G. and Cosenza, E., 2009, Comparative analysis of multi-criteria decision making methods for seismic structural retrofitting, Computer-Aided Civil and Infrastructure Engineering, 24(6), 432–445. 8- Lu, L. Y., Lin, G. L. and Lin, C. H., 2009, A unified analysis model for energy dissipation devices used in seismic-resistant structures, Computer-Aided Civil and Infrastructure Engineering, 24(1), 41–61. 9- Lin, C. C., Chen, C. L. and Wang, J. F., 2010, Vibration control of structures with initially accelerated passive tuned mass dampers under nearfault earthquake excitation, Computer-Aided Civil and Infrastructure Engineering, 25(1), 69–75. 10- Smith, J. F. and Nguyen, T. H., 2007, Autonomous and cooperative robotic behavior based on fuzzy logic and genetic programming, Integrated Computer-Aided Engineering, 14(2), 141–159. 11- Jin, X. L. and Doloi, H., 2009, Modelling risk allocation decision-making in PPP projects using fuzzy logic’, Computer-Aided Civil and Infrastructure Engineering, 24(7), 509–524. 12- Bungale, S. Taranath, A., 2012, Structural Analysis and Design of Tall Buildings-Steel and Composite Construction, CRC Press, Taylor&Francis Group, New York. 13- Moon, K., Jerome, J. and Fernandez, J., 2007, Diagrid structural systems for tall buildings: characteristics and methodology for preliminary design, Structural Design Tall Special Buildings, 16, 205–230. 14- Roberts, T, Sabouri Ghomi, S., 1991, Hysteretic Characteristics of Unstiffened Plate Shear Panels, Thin-Walled Structures, 12, 145-162. 15- Sabouri-Ghomi, S., Ventura, C. and Kharrazi, M., 2005, Shear Analysis and Design of Ductile Steel Plate Walls, Journal of Structural Engineering, (ASCE), 131(6), 878–889. 16- Kharrazi, M., Prion, H. and Ventura, C., 2008, Implementation of M-PFI method in design of steel plate walls, Journal of Constructional Steel Research, 64, 465–479.